Is Yushin Okami Next For Anderson Silva? As Anderson Silva submitted Dan Henderson on Saturday night in Columbus, Ohio at UFC 82, the questions started immediately about whom the No. 1 middleweight fighter in the world would face next after he cleaned out an entire division during his time with the promotion. One name that has been brought up time and again is Yushin Okami, the last fighter credited as a loss on Silva’s record. 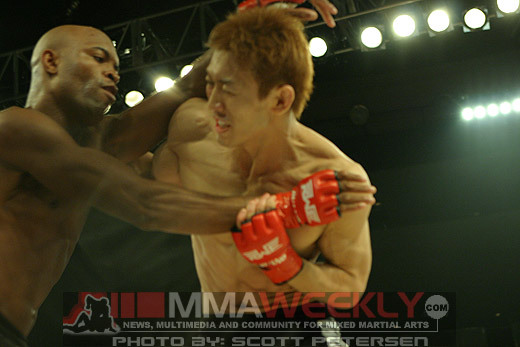 The fight between Okami and Silva took place as a part of the 175-pound tournament held by Rumble on the Rock in January 2006. In the opening round match-up, Okami took Silva down immediately and started to work a ground attack, but just as he did, Silva threw a monstrous up-kick that floored Okami, ending his night. The problem for Silva was that because Okami’s knees were on the mat, his strike was kicking a downed opponent, which is an illegal move. Silva was disqualified and Okami continued on in the tournament. To this day, Silva still does not sound happy when talking about that fight because he explains it was a rule that was not properly explained to him before the bout and that was the reason for the illegal kick. While Silva is determined to fight whomever the Ultimate Fighting Championship places in front of him, he doesn’t discount the possibility of climbing back in with Okami. “If that’s what the UFC thinks to have me face him, I would face him,” Silva stated. UFC president Dana White was questioned after Okami’s fight about his impressive performance knocking out former UFC middleweight champion Evan Tanner. “Yushin’s one of those guys, he’s got a style that he sits back and he waits a lot. He doesn’t have the most favorable style, but he wins fights,” White assessed. “I think as he gets more comfortable in the Octagon, he’ll start to get more aggressive. To Okami’s credit, he is currently 6-1 in the UFC with wins over Tanner, Alan Belcher, Kalib Starnes, and Mike Swick. He commented after the fight about his role in the middleweight division title picture. White did express that Okami is a relevant player when it comes to what’s next for Silva. “I think he is,” he said about Okami’s presence as a contender to the middleweight belt. One fighter who won’t be facing Silva for the title in the near future is World Extreme Cagefighting middleweight champion Paulo Filho, who the UFC champion trains with. White didn’t rule out the possibility though, despite Silva’s training status with Filho. For now, Silva will enjoy another impressive victory and let the organization figure out who’s next.